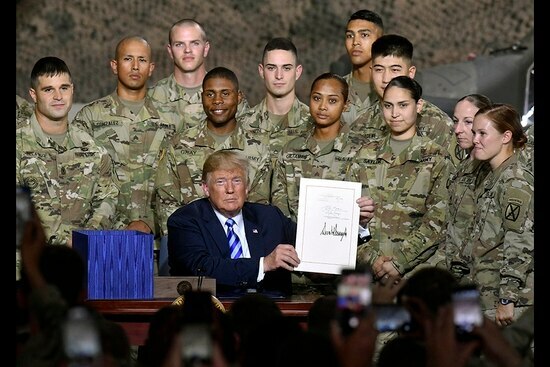 President Trump signed the annual defense spending bill at Fort Drum on Monday, a $716 billion package to fund the military. Trump said getting the spending deal done "Was not very hard," and that it represented a historic funding amount for defense. 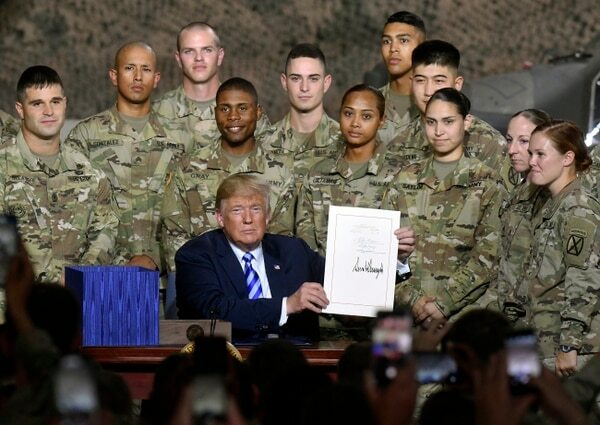 WASHINGTON — U.S. President Donald Trump signed the $716 billion defense policy bill for fiscal 2019 into law at the Army’s Fort Drum in New York on Monday — making personal pitches for Republican candidates and his controversial Space Force proposal. At a giant ceremony in an aircraft hangar, Trump called out specifics in the National Defense Authorization Act, such as the setting of military pay raise at 2.6 percent starting next January, its additions of 15,600 more troops to the armed services’ overall end strength, and a laundry list of added aircraft and ship purchases above what the White House requested. 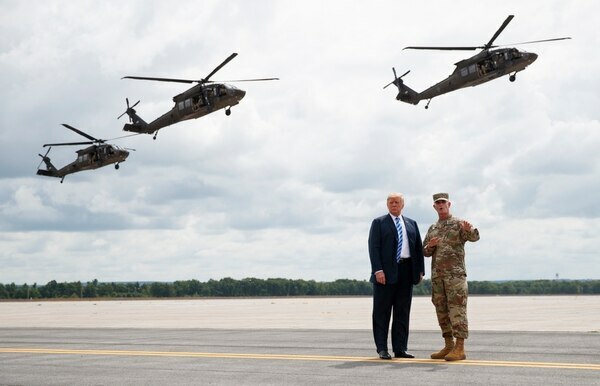 Trump’s visit to Fort Drum, home to the 10th Mountain Division, was marked by a military exercise that included artillery fire and rotary-wing aircraft. Vice President Mike Pence, the Joint Chiefs of Staff and Deputy Defense Secretary Patrick Shanahan attended the event — and more than a dozen uniformed soldiers flanked Trump as he signed the bill. The 2019 NDAA is named for Senate Armed Services Chairman John McCain, R-Ariz., who has been battling brain cancer at home since last year, but Trump did not mention McCain, a repeated critic of his. Trump also claimed credit for the bill’s Pentagon spending boost, though it represents an increase over his budget request, hard won by McCain and Rep. Mac Thornberry, R-Texas, the chairman of the House Armed Services Committee. This was Trump’s first visit to upstate New York since becoming president. Fighting to maintain Republican control of the House, Trump is set to attend a fundraiser Monday for Republican Rep. Claudia Tenney, who is locked in a competitive race with her Democratic rival. President Trump has ordered the creation of a new branch of the military focused on space — something his own secretary of defense has opposed. At the ceremony, Trump recognized Rep. Elise Stefanik, who represents Watertown, home to Fort Drum, and chairs the House Armed Services Subcommittee on Emerging Threats and Capabilities and sits on the House Intelligence Committee. Though Stefanik’s district is comfortably red, The New York Times spotlighted her re-election race as an example of where Independents represent a powerful force. “She’s an incredible representative,” Trump said, later calling out her work to add artificial intelligence provisions to the NDAA. Trump also briefly recognized HASC member Rep. Martha McSally, R-Ariz., who is vying for the GOP nomination for Senate. Also in the audience, McSally did not endorse Trump in 2016, but has sought his support to help edge out more right-leaning contenders. The 2019 NDAA passed the House by a vote of 359-54 and the Senate by 87-10. This early passage of the NDAA into law — lawmakers labor until late fall before reaching agreement on the legislation — gives lawmakers facing midterm re-election fights some campaign-trail fodder. No words or thanks for the senator and former POW, who is battling brain cancer. It remains to be seen whether those bragging rights will extend to defense appropriations, once lawmakers return from summer recess. The Senate passed a four-bill spending “minibus” for the departments of the Interior, Agriculture, Transportation, and Housing and Urban Development, as well as a number of other government agencies. Earlier this month, Senate Majority Leader Mitch McConnell, R-Ky., announced that he had reached an agreement with Senate Democrats on bringing defense appropriations legislation to the Senate floor later this month, as part of a broader effort to wrap up fiscal 2019 military spending issues before the election. One wild card is Trump’s threat in late July to push the government into a shutdown unless Congress funds his border wall. If appropriations bills aren’t passed and signed into law by Sept. 30, without a stopgap funding measure, it would trigger a shutdown. In a statement Monday, Thornberry said it is “essential” that appropriations be approved before the start of the fiscal year. He and other pro-defense lawmakers have pressed for predictable defense spending on the grounds that shutdowns and stopgap spending is wasteful and harms military readiness.